The first job this month was to remove all the clamps from the inner shere and trim off the overhangs flush with the bulkheads. 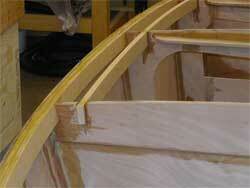 Now I can start the process of fitting the lateral deck beams to each of the bukheads. 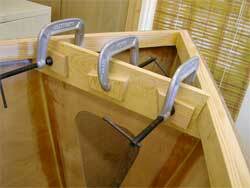 These will stiffen the bulkheads and accept the deck fixings. 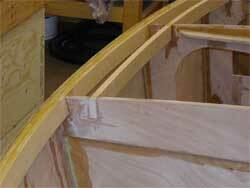 When they are all fitted I'll transfer the bulkhead top profile and trim them to suit.